Headaches are one of the most common health problems people experience. In fact, 45 million Americans wake up to chronically recurring headaches every day, including tension headaches, sinus headaches, and migraines. There are many root causes that can produce a headache, including constipation, poor digestion, low blood sugar, hormonal imbalances, excessive intake or withdrawal from caffeine or alcohol, poor neck and jaw posture, eyestrain, sinusitis, food and environmental allergies, emotional stress, and nutritional deficiencies such as vitamin B6, magnesium, and essential fatty acids. Luckily, there are a number of natural remedies for headache relief, especially essential oils. Essential oils for headache relief are safe and effective treatments that get to the core of the problem. Conventional painkillers can provide relief as well, but they can also have various side effects including diarrhea, nausea, and liver or kidney damage. There are many brands of essential oils for headaches; be sure to purchase only from a reputable vendor offering high-quality oils. How do essential oils treat your headache? Essential oils are loaded with health benefits that help reduce stress and inflammation, improve circulation, and provide overall relief and immune support. Headaches are especially common in women due to frequent hormonal fluctuations. For instance, women will experience a drop in estrogen before and during menstrual periods. Using essential oils for headaches during pregnancy or menopause can help. Here are five essential oils for headache relief. Lavender oil can relieve the associated symptoms of headaches, such as sleep problems and restlessness. Lavender essential oil can help relieve tension and stress with its anti-anxiety, anticonvulsant, sedative, anti-inflammatory, and antidepressant properties. Research confirms that these properties are a result of its high linalyl acetate and linalool content. Lavender oil can relieve the associated symptoms of headaches, such as sleep problems and restlessness. Low serotonin levels also contribute to migraine headaches, and lavender can help regulate serotonin levels and control nervous system pain. In a placebo-controlled study published in the journal European Neurology in 2012 (1), researchers found that lavender oil can effectively manage migraine headaches. In the study, 47 participants inhaled lavender oil or liquid paraffin for 15 minutes. Headache severity was then recorded every 30 minutes for a two-hour time frame. From the 129 headache attacks, 92 responded partially or entirely from the lavender oil. Only 32 of 68 headache attacks improved from the liquid paraffin placebo. You can relieve tension headaches and stress by applying a few drops of lavender oil to your temples, wrists, and neck. Peppermint oil for headaches can be applied on your temples and forehead for relief. The ability to stimulate blood flow and inhibit muscle contractions makes peppermint oil an effective essential oil for tension headaches. Peppermint oil for headaches can be applied on your temples and forehead for relief. According to research published in the German journal Der Nervenarzt in 1996 (2), peppermint oil provided a safe and effective alternative remedy for headaches. Forty-one participants with 164 headache attacks were analyzed in the study. 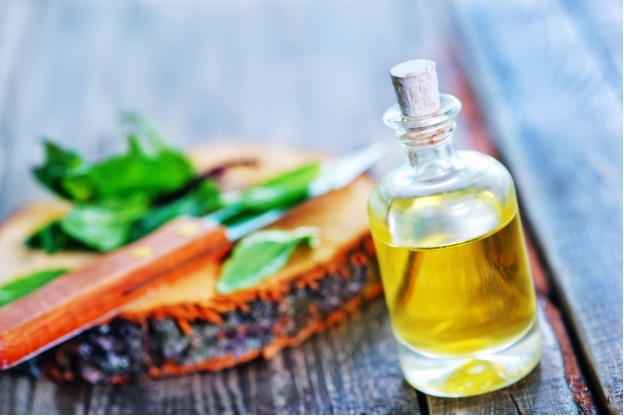 Another study published in the journal Phytomedicine in 1995 (3) found that the combination of peppermint oil and ethanol was an effective treatment in reducing headaches in 32 people. Rub a couple of drops of rosemary oil, peppermint oil, and coconut oil to your forehead or temples. Rosemary essential oil has been used to treat poor circulation and headaches for centuries due to its analgesic, anti-inflammatory, and stimulating properties. It can also reduce potential headache causes such as digestive problems and stress. To take advantage of rosemary essential oil for headache relief, simply add it to soup, water, or tea when you experience a migraine or headache. You can also rub a couple of drops of rosemary oil and peppermint oil, plus a teaspoon of coconut oil to your forehead or temples. 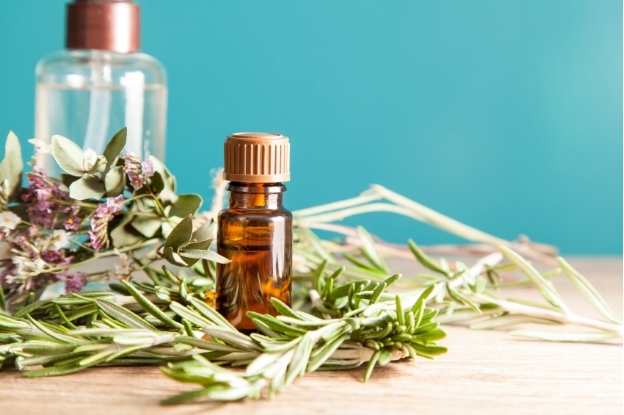 In a study published in the journal Addiction and Health in 2013 (4), internal use of rosemary essential oil helped alleviate withdrawal symptoms in patients with a history of opium addiction, including headaches, insomnia, and nausea. 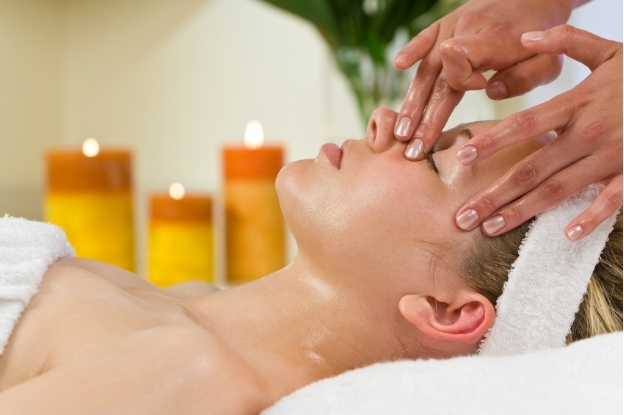 Eucalyptus oil works to alleviate sinus tension associated with migraines and headaches. Eucalyptus oil comes from the eucalyptus tree or the Tasmanian blue gum tree, and it works to alleviate the sinus tension associated with migraines and headaches. To use eucalyptus oil, combine it with a carrier oil such as jojoba, sweet almond, avocado, and coconut, and apply to your temples, forehead, chest, and the back of the neck. 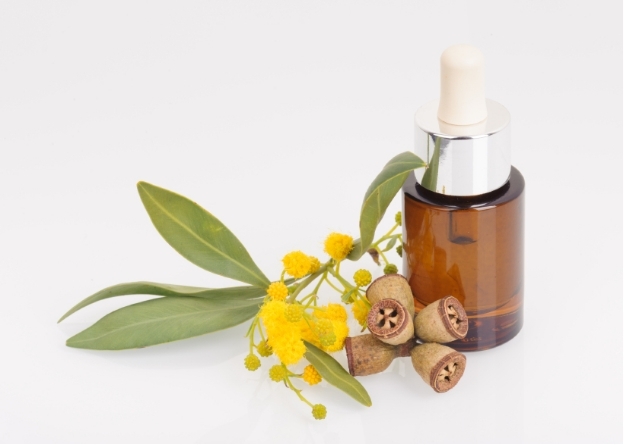 A study published in the journal Evidence-Based Complementary and Alternative Medicine in 2013 (5) found that the anti-inflammatory effects of eucalyptus oil can reduce edema formation in 52 patients who underwent knee replacement surgery. These effects are also thought to benefit people with tension headaches. 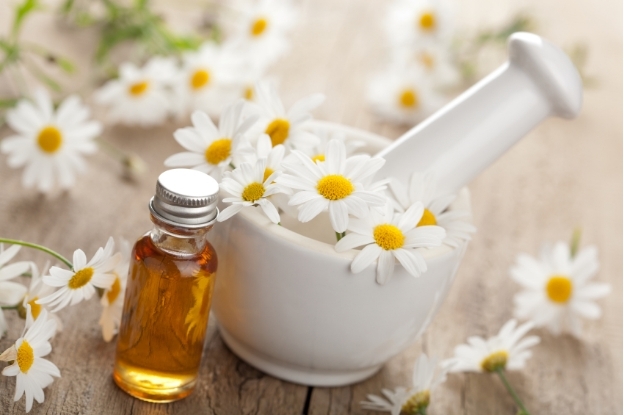 Chamomile oil encourages relaxation, and can treat conditions linked with headaches. Roman or German chamomile is another good essential oil for relieving headaches at night due to its anti-inflammatory, neuroprotective, and sedative properties such as isobutyl angelate. In an article published in the journal Medical Hypotheses in 2014 (6), researchers hypothesized that chamomile oil could help relieve migraine headache pain. Chamomile oil also encourages relaxation, and can treat the conditions linked with headaches such as depression, nervous tension, and irritability. There are also various other essential oils that benefit those with headaches or migraines such as helichrysum, spearmint, sandalwood, basil, bergamot, clove, frankincense, Idaho balsam fir, ginger, neroli, jasmine, myrrh, sweet marjoram, wintergreen valerian, violet, thyme, sage, rosewood, linden, lemongrass, lavandin, hops, grapefruit, cumin, and citronella. Essential oils can be used topically on the wrists, forehead, temples, or where the sinus cavities are found, to reduce tension and alleviate stress. There are various ways to use essential oils to soothe migraine or headache attacks, but it’s important to note that many headache sufferers are sensitive to scents, so it’s a good idea to test the essential oil on a cotton ball first to see if the smell is aggravating. If the essential oil is well tolerated, you can use the oil in a diffuser or use it topically by combining it with a carrier oil. 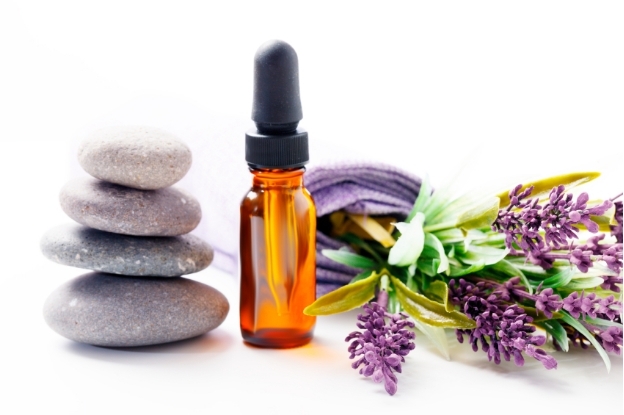 Essential oils can also be taken orally as a capsule with water or tea. Here are some specific ways to use essential oils for headaches. Tension headaches, or stress headaches, are associated with throbbing in the head or neck, tension in the neck or shoulder area, and the sensation of a tight band around the head. Eucalyptus, peppermint, or chamomile oils can be used topically on the wrists, forehead, or temples to reduce tension and alleviate stress. A migraine is a pounding headache, typically on one side of the head. Many migraine headaches can last several days, and sufferers often get them once a month. Migraines are very painful, and are often accompanied by nausea, vomiting, an extreme sensitivity to light, and vision problems. Migraines are usually triggered by hormonal changes, anxiety, stress, and sleep deprivation. For best results against migraine headache relief, massage peppermint or lavender oil into the back of your neck or your temples. What about essential oils for sinus headaches? A sinus headache occurs when sinus cavity membranes become swollen and inflamed. Pressure is felt in the forehead area, where the sinus cavities are found. Eucalyptus oil is best for sinus tension relief when used topically on your temples, nose, and chest. The right essential oil for a headache can go a long way toward relieving the pain associated with migraines, tension headaches, and sinus headaches. 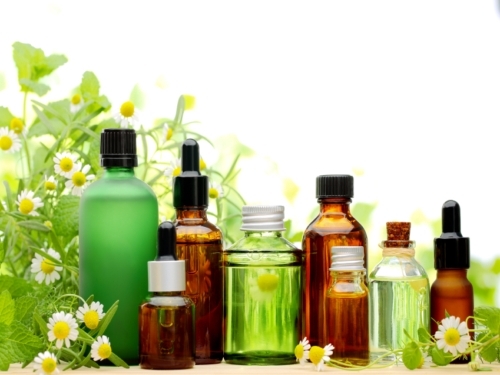 However, essential oils can produce minor side effects such as skin rashes. These oils should be diluted before applying them topically to sensitive areas like the forehead or nose. When using essential oils internally, it’s important to remember that you don’t need much for the oils to be effective—one or two drops is all you need. Also, essential oils should only be used for a maximum of four weeks before taking a week-long break.